Surgical exploration of an adnexal mass for the management of pelvic pain or to exclude malignancy is a common gynecologic procedure. While most adnexal masses are benign in nature, all surgeons performing pelvic surgery should understand the surgical recommendations of how to proceed when an ovarian neoplasm is identified. 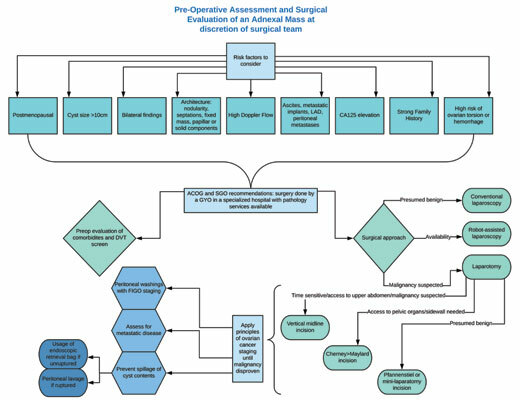 Appropriate pre-operative assessment can help to best identify patients at high-risk of malignancy to ensure appropriate consultation with a gynecologic oncologist. With the evolution of laparoscopy, most adnexal mass surgeries can be performed using minimally invasive surgical techniques. As a guiding principle, all adnexal mass surgery should abide by principles of ovarian cancer staging until malignancy is disproven. Adnexal mass, ovary, ovarian cancer, laparoscopy, surgery, serum tumor marker.